Now with a new postscript and reading group guide, perfect for book clubs. After nearly dying of breast cancer in her twenties, Sarah Thebarge fled her successful career, her Ivy League education, and a failed relationship, and moved nearly 3,000 miles from the East Coast to Portland, Oregon, hoping to quietly pick up the pieces of her broken life. Instead, a chance encounter on the train with a family of Somali refugees swept her into an adventure that changed all of their lives. Half a world away from Somalia, Hadhi was fighting battles of her own. Abandoned by her husband, she was struggling to raise five young daughters in a culture she didn't understand. 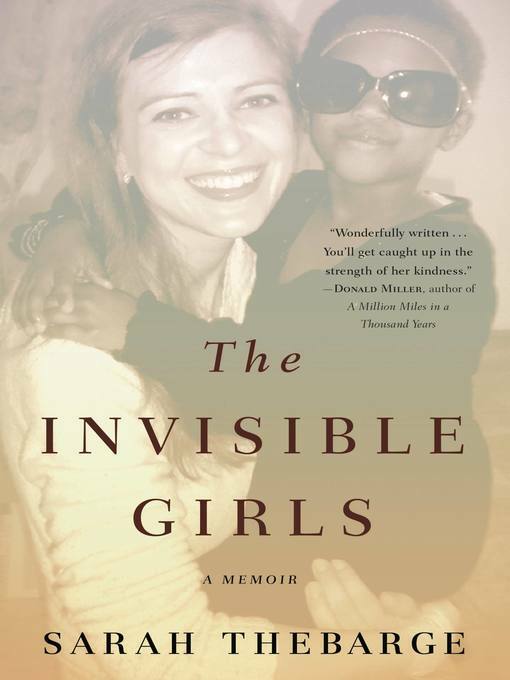 When their worlds collide with Sarah's, Hadhi and the girls were on the brink of starvation in their own home, "invisible" in a neighborhood of strangers. As Sarah helped Hadhi and the girls navigate American life, her unexpected outreach to the family became both a source of courage and a lifeline for herself. Exquisite, at times shattering, Sarah's enthralling memoir invites readers into her story of finding connection, love, and redemption in the most unlikely of places. All proceeds from the sale of the book go toward a college fund for the five Somali Invisible Girls. For details, visit www.sarahthebarge.com.